Ludicrous combination of iPhone 6, Lightning to 3.5mm adapter, and Sennheiser HD800 :-). Well, as you likely already know, since the iPhone 7, Apple has removed the 3.5mm headphone port from their phone devices. Ostensibly, the rationale being that this would allow more space in the device for other goodies to enhance the feature set of the phones. In place of the missing headphone port, Apple has included the "Lightning to 3.5mm Headphone Jack Adapter" with their phones. I've been wanting to have a look/listen to how well this little dongle thing performed for awhile but since I'm an Android guy and nobody close to me upgraded their iPhone when the 7 came our, I just remained patient. Well, over the holiday season my sister-in-law upgraded to an iPhone 8, so I finally got a hold of one of these Lightning-to-analogue out dongles to test out at my leisure :-). As you can see, I've got my usual set-up running to measure the output from that little dongle attached to an iPad Air 2 in this image. Yes, it works, in fact this adapter should work with any iOS 10+ device. For RightMark measurements, I'm using the latest 6.4.2 PRO version. Both the iPhone and iPad are on the latest iOS 11.2.2 (notice I'm using the iPhone 6 because I also want to compare the output with the headphone out on the same device). For bit-perfect playback, I'm using Onkyo HF Player latest version 2.6.0 (obviously, all EQ and resampling off) using FLAC-encoded test signals. Since I didn't find any meaningful difference between the iPhone and iPad measurements, apart from the impulse response and square wave, the rest were recorded from the iPhone for consistency. Not a bad looking 1kHz square wave. Peak voltage around 1.4V (or ~1Vrms, the same as iPhone 6's headphone out). You can see the right and left channels are well balanced. Not bad for essentially an inexpensive external DAC, I've certainly measured more expensive devices with poorer results. 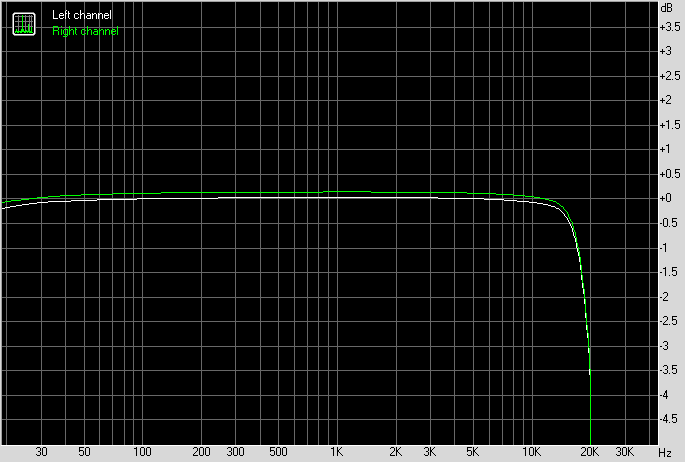 Headphone output impedance with a 1kHz sine wave was approximately 1-ohm. Again, pretty good, should not pose any frequency response issues even for low impedance IEM headphones. Looks similar to what I found with the iPad Air 2 measurements awhile back. Similar enough to say that we're likely looking at the same DAC chipset inside with essentially the same filtering parameters. Without overloading the DAC by using the -4dB wideband noise, we see that it is a relatively sharp anti-imaging reconstruction filter though not exactly the most precise filter resulting in some ultrasonic "rippling" artifacts above 25kHz. As you can see, the signal has been resampled down. Notice that I'm compared this adapter with the iPhone 6's native headphone jack (2nd column), the PonoPlayer, the SMSL iDEA, and my main sound room DAC the good ol' TEAC UD-501. Overall, as you can see, these days standard resolution 16/44 doesn't pose much trouble even for cellphones and a dongle like this! Most of the difference is in the tiny levels of THD and IMD. The other thing here is the PonoPlayer's unusual frequency response due to the type of digital filtering Ayre uses (minimum phase, very slow roll-off as discussed before). Alas, I typically don't bother measuring 24-bit 44kHz signals so there's really nothing good to compare this to :-). What we can say is that from a noise level perspective, the Lightning Adaptor is managing to provide up to another 3dB lower noise floor / higher dynamic range. The iPhone 6 though is capable of a better noise floor than this Lightning Adaptor. As you can see, we're now comparing the Lightning Adaptor and iPhone 6 with a couple of inexpensive <$100 USB DACs on the computer. Numerically the iPhone 6's headphone jack holds up pretty well! Admittedly, I've always been a bit disappointed by the AudioQuest Dragonfly DACs I've measured (including the version 1.2 from a few years back and the recent Dragonfly Black). 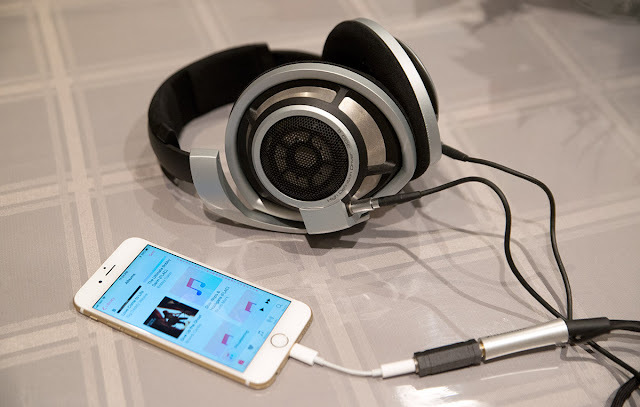 We can say that the Lightning Adaptor provides approximately 16.5-bit resolution whereas the 3-year old iPhone 6's headphone output is capable of just slightly over 17-bits. For the price, so long as your device is compatible, the SMSL iDEA remains comparatively impressive from an objective quality perspective! 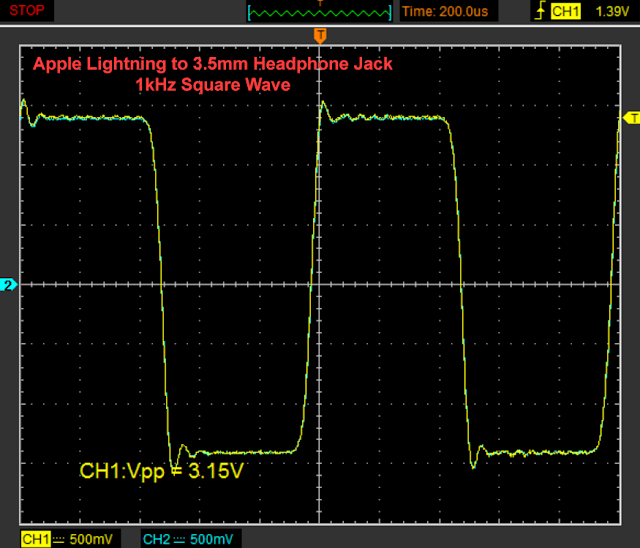 So, what does jitter look like with an inexpensive Lightning DAC!? Not the best but far from terrible! A bit of low-level noise in the noise floor of the 16-bit version which drowns out the usual square wave jitter modulation tone in the LSB. There's some "skirting" of the primary frequency suggesting the presence of low-level timing anomaly. We also see a pair of low-level sidebands. 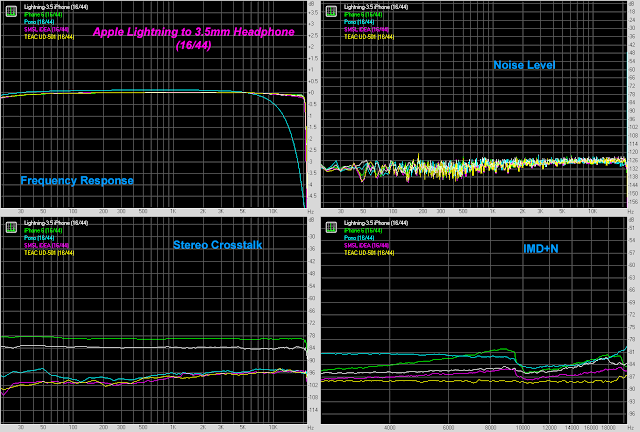 As I've said in the past, jitter isn't really a problem these days for DACs. Remember that the audible spectrum from 20Hz-20kHz is relatively low frequency compared to the demands of megahertz and gigahertz electronics these days and great timing accuracy can be achieved without needing "femtosecond" upgrades. Considering that this is the first time I've looked at a DAC operating off the Lightning connector, I don't see any concerns (nor did I suspect any issue). Like the ubiquitous asynchronous USB DACs that can achieve excellent temporal accuracy these days, I suspect it's the same with these little dongles. I know, I know... Not exactly an "audiophile" device :-). But I think it's useful to measure and have a listen even to something like this in order to obtain perspective on what the "low end" sounds like these days. Arguably this is the least expensive external DAC I have ever measured. It's "free" with current iPhones and replacement cost is around US$10 at the local BestBuy. It's also the first time I've put any Lightning port device through the test kit demonstrating yet again that jitter doesn't appear to be an audible issue although obviously that was not the nicest looking Dunn J-Test result I've ever seen. BTW, I've seen little actual information on the Lightning port, a proprietary Apple digital interface of course, said to be able to transfer data at around 25-35MB/s; about the speed of USB2.0. So how does it sound? It's okay. I did listen to a few tracks through the iPhone and this adaptor with my Audio-Technica ATH-M50 headphones (99dB/mW sensitivity) and it sounded decent enough. The volume was strong enough for enjoyment and frequency response was fine although subjectively I thought I could hear a bit more bass in some of the music with a stronger headphone amp... For example, recently I've been listening to Temples' Volcano (2017, DR6). A good psych-rock-alt upbeat album. Far from the best sounding recording but the iPhone + Lightning Adaptor had no problem conveying the "energy" similar to my desktop DAC (the old ASUS Essence One). Lü Siqin's rendition of the classic Chinese piece The Butterfly Lovers Violin Concerto (1997, DR12) sounded pretty good still with the combo of Audio-Technica headphones + iPhone + Lightning Adaptor although for classical I do prefer the more "intricate" sound of open headphones (like the Sennheiser HD800, but that's of course in another price category!). Ultimately, this little adaptor is a utilitarian device that compensated for the loss of the headphone jack starting from the iPhone 7. It basically provided the same sonic features (24-bits up to 48kHz) as the headphone output from the iPhone 6. Objectively it's actually a little noisier than the iPhone 6's jack with otherwise relatively equivalent distortion characteristics. 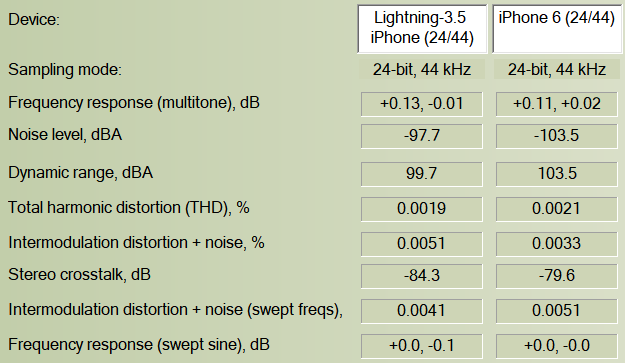 One improvement is the output impedance is lower at around 1-ohm (as compared to about 3-ohms with the iPhone 6 at 1kHz). I see that iFixit had a "teardown" of this adaptor awhile back. The DAC (which also has ADC built-in) remains unidentified. It looks like c't also ran some measurements but did not look at jitter and digital filtering... The bottom line is consistent with my test here; that the adaptor is slightly less resolving than the iPhone 6's jack in terms of noise performance and dynamic range. Considering the similarity of the digital filter graph above to my previous iPad Air 2 measurements, I suspect Apple used the same basic DAC across the iPad and iPhone lines, just that in this case they attached it to the Lightning interface of course... Given Apple's history of using Wolfson/Cirrus DACs, I wouldn't be surprised that they used some variant of the WM8533 which was used a few years ago in their Lightning to 30-pin adaptor. Ultimately, of course Apple wants recent iPhone users to buy wireless Bluetooth headphones from Beats with their W1 chip :-). Hmmm, nothing much new this week in the audiophile world. I noted last week from CES 2018 that Creative's Super X-Fi headphone technology is "making waves". Looks like the AVSforum has awarded it the "Best of CES 2018". Nice. Like I said last week, it would certainly be nice to see more multichannel music be done and if it takes the support of the headphone crowd to move it forward, I'm absolutely all for that (notice on the demo in the video they're using a stereo Steely Dan track from Two Against Nature, I wonder how the multichannel DTS/DVD-A rip will sound)! The Super X-Fi system is supposed to use a picture of one's ears to estimate the HRTF which is quite the feat (if it works as claimed) although of course getting customized measurements are always better. Internally, it processes up to 8 channels of 24/96 audio. I wonder how the multichannel data gets into it, what bitrate is being sent to the dongle device (is it lossless?) and what kind of drivers we might need to install to get it working for the typical consumer (USB to computer system?). If you've never heard the cable salesmen present Fear/Uncertainty/Doubt and why you need to spend extra money on cables (beyond otherwise decent wires and connectors - I'm not talking about toss-away red and white RCA connectors from Walmart DVD players of course), this is a good example of how they want you to be concerned about noise and interference. He believes there's a lot of electrical and RF noise all around us these days (could be true depending on where one lives) and modern wireless electronics like Bluetooth transmission has ruined music if you don't use "good" cables and power devices... Warning, this is time you're never going to recover in your life but I guess as audiophiles, it's part of the "price of admission" into the experiences of this hobby :-). Anyhow, if you want to listen to "proof", start at 33:40 (yes, after 15 minutes of Adspeak). See if you agree that without AudioQuest products, the "room fell apart, bass was uncontrolled, and you know... it's like falling apart with every transient... and the top band we've just lost an octave... lost the whole definition and the whole thing is distorted and smearing because we don't have a filter we don't have the ground or its dissipation and mainly we're not giving the power supply the current it needs on demand when it needs it... we're not buffering, it needs that" (big breath here now). Sure. The second demo was of ~1 minute of Muddy Waters from Folk Singer ("My Captain"). First, he uses a generic cable "$4-5 chord from China and it sounds like it" (gee, no bias there), then followed by their $625/m AudioQuest Thunder cable connected to the Simaudio Moon CD player (Simaudio amps and Magico speakers apparently for the rest of the system). Let's see, the AQ A/C cable is 125x the price of that China-made generic (for 1m). And that's of course the bottom of the rung for their recent "Storm" A/C cable line-up; next up that series is the Tornado for $1000/m (surely any self respecting audiophile cannot just pick the bottom tier cable!) all the way to the US$4400, 1m length, Dragon (for the most discerning audiophile of course). Obviously YouTube is far from the best way to show an effect given the lossy compression which is bad enough but we also have camera movement, room noise, suboptimal seating, and some clipping in the original recording. I assume Fremer must believe the video is capable of demonstrating the difference... Which begs the question of why AudioQuest doesn't just release some measurements if it's that clearly audible! For convenience, if you want to better assess the sound from the Muddy Waters demo, download the comparison files here and A/B at your leisure (I highly recommend using Foobar with ABX Tool and flipping back and forth between the 2 samples). Interestingly, the AQ cable version was slightly louder by 0.2-0.3dB; however, the peaks were clipped so it is possible that this is an underestimation and it could have been slightly higher if one were in the room. Also, I don't know if the camera/camcorder has variable gain applied to the recording. See... Proved it, end of debates on power cables! AC cables make a "huuuuuuuuge" difference :-). Tell me what you think. Have a great week ahead everyone and hope you're all enjoying the music. As for the -60dB 1kHz tone to look for obvious bitdepth truncation which typically should exacerbate odd-order distortion. I don't see it, but Lightning adaptor is much "dirtier" than just the iPhone 6's headphone out! The DFC of Apple Lightning adapter looks a bit fishy to me, there are a lot of tiny spikes below Nyquist but they are absent above Nyquist. This leads me to think that the adapter is actually running at 48kHz fixed with OS resampling. 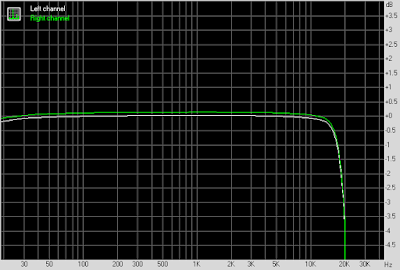 Do those spikes disappear if you run the DFC at 48kHz? Also, RMAA by default (and forced in free version) applies dither in the Noise level test, therefore even if the playback device only supports 16-bit, it can still score higher in 24-bit tests due to the absence of 16-bit dither. Did you see signs of bit truncation in the 24-bit test, for example, abnormal harmonics in the -60dB Dynamic range test? Good points Dtmer. That thought did cross my mind about 48kHz fixed... I'll have a peek later! For the noise measure, though I have the option to turn off the dither signal with the 'pro' version, I typically keep it on for consistency over the years. Might as well "bottom" out on the 16-bit test consistent with what one at least expects for the type of signal. 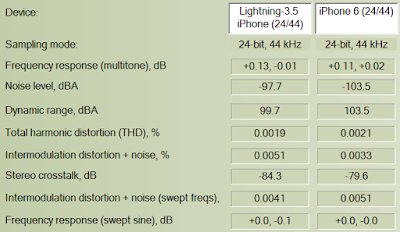 Hmmmm, not sure about truncation but the Lightning-to-Phono -60dB 1kHz tone looks really "dirty" compared to the iPhone 6 (24/48 shown)! Thoughts on that's going on here!? Thanks Archimago! 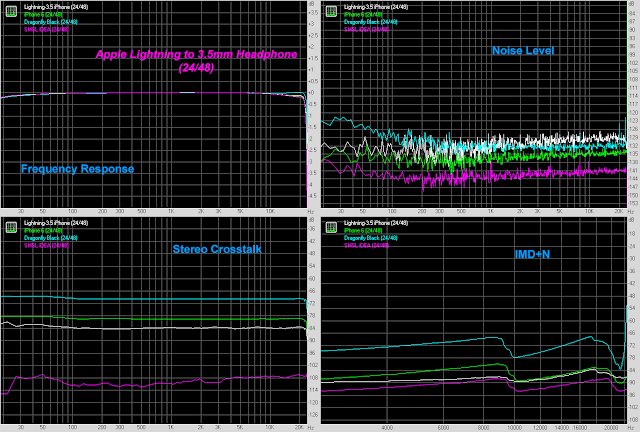 Agree with your comment that running in 48kHz made no improvement at all. I "grew up" with low end PC soundcards and many people at that time was looking for signs of low quality SRC and bit truncation so may be I was too sensitive. BTW it seems that the adapter has less severe clipping in the 0dBFS white noise test than most of your tested products, despite the not-so-clean stopband filtering. reading your post an out of topic question came to my mind. So, please forgive me! Qobuz releases a lot of material@ 24/96 under the (expensive) Sublime+ subscription. Wouldn't better to down sample this material @16/48 (and having it less expensive)? So, what do you guess sounds better? a 16/44.1 or a 16/48? Take into account that most of the companies now record @24/192 so, in any case the mathematics to go to 16/44.1 is a little bit complicated. Good question and one we can spend a bit of time thinking about! You know, let me think about this and maybe this would make a great "MUSINGS" post... Potentially lots to discuss when it comes to streaming and how we judge value. Technically, you're right though. 16/48 IMO sounds great. In fact these days most of my vinyl rips get downsampled and dithered from 24/96 to this. It'll be just a little larger than 16/44 FLAC, Nyquist pushed another 10% out. As for which "sounds better", well, that I think depends on one's DAC. As you say, if recordings are multiples of 48kHz like 96 or 192kHz then the simpler integer downsampling will be easier. According to Music and Audio: A User Guide To Better Sound, there are very few who record their entire blockchain in anything above 24/96, most tracks are just upsampled to fit the larger bitbucket. Mark has been on a the record for some time saying anything above is mostly fairy dust for us Mortals. While hardware can be bought quite easily, I truly wonder how many studios, audio engineers and artists adhere to practices and the discipline required in the studio end to ensure actual 24/96 output with minimal loss of resolution. I bet very few. And the ones existing would likely be with the classical, vocal, and acoustic jazz productions. Practically, I see no need for 24/176 or 192kHz music. Interesting read, thank you. Any plans to do a similar examination of the Google USB-C to 3.5mm dongle (https://store.google.com/us/product/usb_c_headphone_adapter?hl=en-US)? Well, I currently don't have a USB-C Android phone... Been thinking of upgrading from my Note 5 to the Note 8 though so maybe if I go that route and find the need for something like this :-). 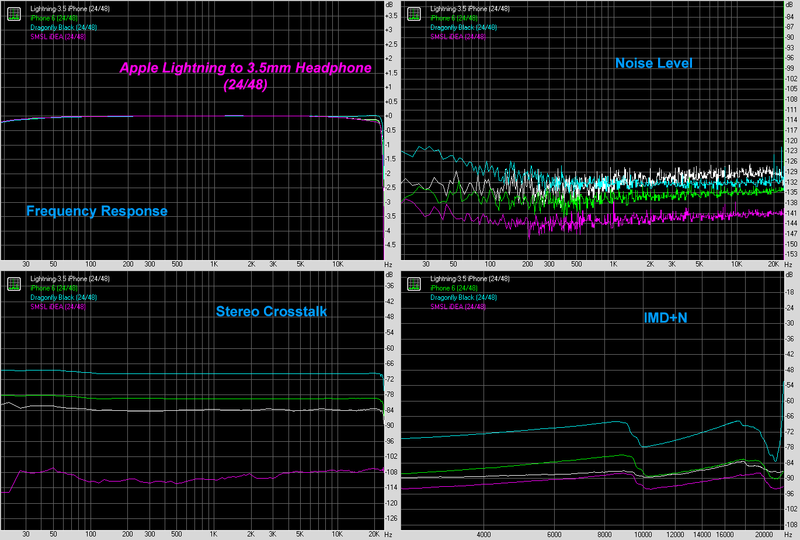 If you are interested, here are some measurements and data(impedance, crosstalk etc) on various USB-C Dacs running on the Pixel 2. The main issue is actually with Android. 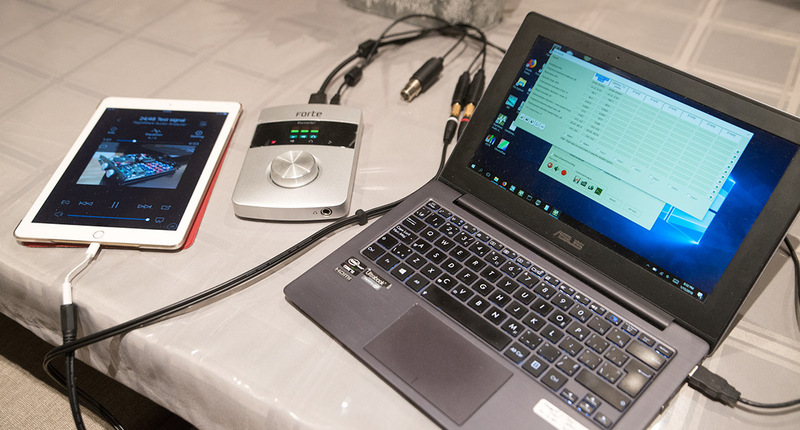 The OS sets the Dac digital gain to max automatically, and the net volume out is adjusted by the android OS. This creates unwanted distortion banding. If you are rooted, there is a work around. Michael Fremer is still in the biz?? Wow. As for USB-C on phones, not a big fan of that. 99% of used controllers cannot manage speeds above USB 2.0 and C cables are unnecessarily complex, less DIY friendly (need active negotiation) and a lot more expensive. Plus if I accidentally forget my microUSB cable, there's high chance one of my colleagues will have one readily available. Just read the comments for the AC cables, Fremer does some top level trolling. It was probably said hundreds of times, but I was once placebophillistic audiophool and personally, getting involved on the objective part of the equation was remarkable eye-opening experience. It might seem almost absurd, we all die one day or the other - in the final moment, isn't it too late to realize we clinged so firmly to our beliefs? What else can a man/woman do than constantly revise their belief system by getting some sort of confirmation in the natural order? I guess part of the problem lies in peer pressure and society of "do not question your elders". But that would mean a world without knowledge. Thanks for the link to the Diamond HDMI cable review... Wow, fantastic creativity out there. Truly top notch writing from A/V'philes! This stuff is gold... make that diamond! Some of the most entertaining writing I've seen :-). Admittedly, I have not played with USB-C devices much; other than my computer motherboards and the SMSL iDEA adaptor, I don't have USB-C devices. The one practical benefit is the symmetrical connector so at least no fiddling in the dark when plugging a phone to charge in the car :-). I do like that about the Lightning connector. As for Fremer (and some others in the audiophile press). I guess over time we become the ideologies we subscribe to when it takes up so much of our identity. He has become the persona of "Mr. Vinyl" and all that comes with it. He gets paid for it, he has a following who strongly ascribes to it, he's "respected" for these views, etc... It's an interesting phenomenon to think about socially and culturally. Good to be balanced and not get stuck in the extreme and become literally a worn out caricature. Nothing wrong with being a highly knowledgeable "authority"; but I think it better come with it a good level of humility, and confidence that comes out of reality testing (especially when promoting stuff like an A/C power cord). Recently I bought a new phone. This one still have a 3.5 headphone jack but a lot of phone are dropping it. Much to my surprise the UAC-3 standard allows for analog out. In Alternate Mode some pins will carry the analog out of the build-in amp. Obvious USB-C is then most analog sounding digital bus! Thanks Vincent. Didn't know about that analogue/digital convergence in USB-C. Well, I guess it truly is one port to rule them all then :-). I was notice that my iPad Air (1st gen) shows strange cut-off frequency under 20 kHz when my A1749 was feeding by 44 kHz signal. Frequency response turns to "usual" when i set 48 kHz test audio. I use RMAA 6.4.2 Pro also as you. Its no such effect when i try iPhone, but A1749 on iPad Air really suprise me. Maybe its something mismatch between clocks of each devices? Did you use Onkyo HF Player as well? Re: "For convenience, if you want to better assess the sound from the Muddy Waters demo, download the comparison files here and A/B at your leisure (I highly recommend using Foobar with ABX Tool and flipping back and forth between the 2 samples). Interestingly, the AQ cable version was slightly louder by 0.2-0.3dB; however, the peaks were clipped so it is possible that this is an underestimation and it could have been slightly higher if one were in the room. Also, I don't know if the camera/camcorder has variable gain applied to the recording." -- where do you detect clipping in the downloaded files? I don't note anything obvious in either one, viewing the waveforms in Audition. -- something fishy is going on here though. Do a frequency profile of both (I used Audition, scanning each whole track, then graphing the difference at each frequency), and you'll see what I mean. From what I can tell in the video, these are supposedly from the same CD. The two profiles should not be as different as they are, if the only difference is the AC cable. For example, the AQ version is cutting high frequencies *in one channel* above 16 kHz...! 1. The clipping was an issue with my 1st rip that I posted to Fremer's blog comments. I since dropped both levels by 1dB but you can still see "remnants" like say around 45.8320 in the Thunder cable track. 2. Hmmm, the spectrum is "more different" than one would expect from the same CD but given the poor "camcorder" quality, extraneous room noises, movement issues, transcoding to YouTube lossy, etc... I would not read too much into these differences. Since these were both YouTube rips, the lossy encoding cut off around 16kHz for both tracks I believe. 3. Interesting. I haven't heard the 1999 SACD but have heard the 2011 Analogue Productions and have the old 1999 HDAD from Classic Records. With "classic" recordings like this one, we almost need a "cheat sheet" somewhere to tell us which of the versions would be the "best" :-). 1. ok, will recheck, thanks! 2. Ah, are you saying the audio in those files are 'live' recordings of CD playback in the room, furthermore processed by Youtube?? I hadn't realized that, I figured they had redigitized the player analog output and provided those files. What rubbish! 3. If these are indeed 'acoustic' recordings of in-room playback etc, all comparisons to other versions are off! (The SACD version btw sounds -- and measures -- amazing. I haven't heard other versions except these silly demo files). OK, checked peaks and Audition is telling/showing me that the track peak is at timepoint ~0:0.1265 in the right channel. It's a normal-looking peak, just grazing (not clipping, -0.03dBFS) digital maximum, and thus higher than the peak at 0:45.8320 (which looks a little ragged but not 'flat-topped') so I don't see how there could have been real clipping elsewhere...but given the provenance of these files I'm not sure it's even worth speculating! I remember Chris' review stating that the Berkeley Alpha Reference was the best DAC ever on redbook. I wonder how it would stack up to this little no never mind found in one's iPhone box? On redbook only of course! I'm still taken back to Papa Pass' interview when he talks about end of science as it pertains to amplification. Channeling McLuhan (a Canadian!) Nelson said that once the objective needs are solved we turn our technology into art. For computer audio the problem is that it's not a very good canvas. There's only so much you can do with 1's and 0's. 90% of my collection is redbook and my streaming is either Amazon of Spotify. Until there is a REAL revolution in SQ I think I'm just going to keep my wallet in my pockets. You've touched on a very important philosophical and sociological observation which as time passes and technological maturity progresses will be even more evident in other consumer devices beyond audio. I'm not sure what qualities are used to judge "the best DAC ever for Redbook". Physical esthetics like color, number of buttons, LED indicators? Ergonomic remote control? Heft of the case? Digital input choices? 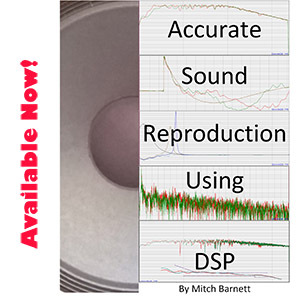 Features like different digital filters and DSD resampling? Minimum price tag? All I can say is that it certainly would be very interesting to run a volume-controlled blind test between this "free" dongle with an expensive DAC and record the preferences of a group of audiophiles :-). As for a real revolution in audio... I'm sure there will be incremental changes, but I don't think it'll come with standard 2-channel audio until we hack the human CNS and start feeding audio directly into the inferior colliculi or primary auditory cortex :-). I suspect you'll be safe with that Redbook collection for awhile. Of course, nothing to say DSP processing and multichannel advancements may not show up in our homes and around our ears over the years! And in the digital world time passes much faster than in any other technological field. So someone had done my comparison! And while the iPad and the Alpha Dac 2 convert the same digital information there's just something about the Berkeley that makes it "special." I wonder if that something is science or is it art? Do you want to buy headphone jack adapter at reasonable prices? Then visit FORSA.US. Clarnia offers an exclusive variety of exquisite and top-quality canvas wall art to add elegance to your home and office. Astronomy, nature, animals, abstract art – you name the category, we have it. Shop from our wide variety of modern wall art and custom canvas products with varying sizes and styles to choose from.